Excellent course. A surprising amount covered in three hours. Entirely hands on combined with very good technical information. Great facilities. No improvements to suggest, highly recommended! This was an excellent introduction to welding. Lots of hands on, practical time to get to grips with it all. Would highly recommend anyone interested in trying out welding to give it a go! Really good. Andrew went over all types of welding. He gave us a brief safety instruction and how best to use the certain types of welders/techniques. He then let us get on with it. We had lots of scrap metal to practice on and there were lots of welders, so no one was waiting in line. I feel that I can make something now. Thanks! Professional friendly inclusive educational workshop even for a complete novice. I even got a slow motion vid clip of me taken while using a mic welding . Andrew was attentive and left us to practise when we got the hang of it and he let me take some photos of his machinery . Would recommend for non-artists like myself. It was a great class! Lots of fun - some confusion, as the instructor at one point said that the class was in fact 'basics of welding' and not intro for artists... Still, worth the visit. Excellent - fun and informative. 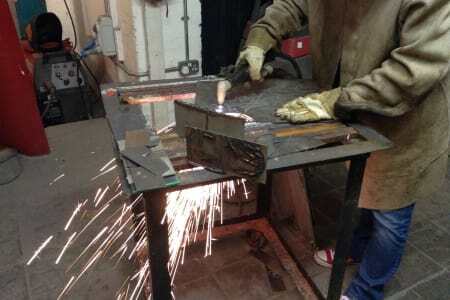 Can't wait to try another class at London Sculpture Workshop! Perfect introduction. Relaxed atmosphere and small class size made this a really good way to acquaint myself with welding. Great tutor, I loved every minute of this class. The tutor Lauren was very clear and covered a lot of information in two days. I learned a lot and am confident enough to continue working with Jesmonite on my own! Andrew was the best! So knowledgeable and helpful! I didn’t think it would’ve been possible to learn all that I did in such a short space of time and couldn’t believe how well my chair turned out! This course has wet my appetite for woodworking and can’t wait to look at doing some projects at home! This was my first proper experience in woodworking and I really enjoyed it. The course is well organised and is very focused on practical work, which is exactly what I was looking for. 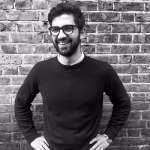 Andrew is a very good and experienced teacher, who is helpful with any advice or guidance you need. genuinely the most fun I've had in ages! Silvina was everything you would want from a teacher she spent a great deal of time with us both collectively as a group and helping us individually. Silvina had a fun and relaxed approach to the course which set the tone for how the group interacted with each other making the course all the more enjoyable. its only a short course so its impossible to learn everything about welding but i felt that we all walked away with a new skill set and the confidence to develop it further independently. the facilities are great, the location is amazing, parking is free, the food is good. i was thoroughly impressed and I couldn't speak more highly of it. I loved this course. Perfect for a complete beginner (me) or professional artist (everyone else on the course). Was a relaxed and playful space with great teacher and views of the river. Have come away with new skill and 6 castings. 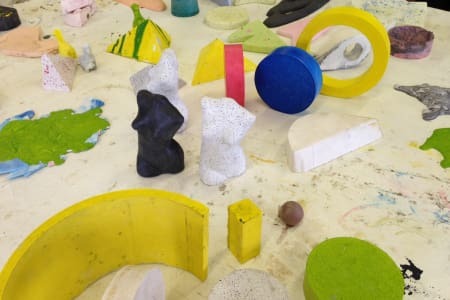 The London Sculpture Workshop is a gem of a place I totally recommend! I loved its atmosphere so much I attended all of the short courses they offer. 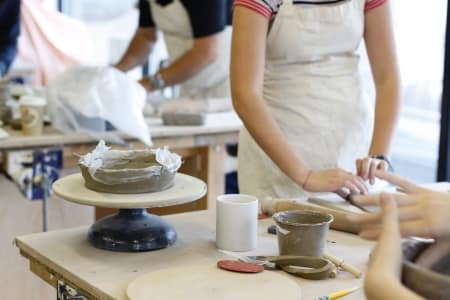 Inspiring tutors – all practising artists, a great variety of classes - from metal work to bronze casting or wood furniture design, in super well equipped workshops. There I met students with very different profiles and objectives, from practising artists willing to upgrade their skill-set or experiment with new processes & materials, to absolute beginners wanting to just “do things with their hands”. 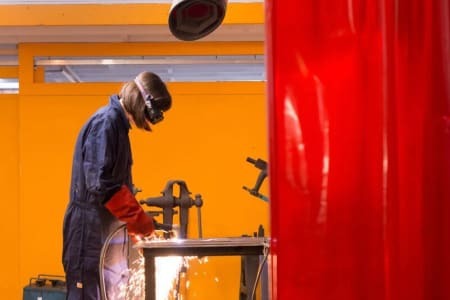 They also offer a open access scheme to a versatile metal and wood workshop where you can develop your own creative projects in your own rhythm, once you feel confident to go autonomous. Truly brilliant place! I really enjoyed the 2 day Casting Plaster and Concrete course, and feel that I learnt a lot in a short time. We made moulds from a variety of materials including sheet metal, clay and wood, and cast-off textured materials (i.e. bubble wrap). There was the opportunity to try a range of materials including plaster, fibrous cement, concrete, and fast-setting concrete. The tutor was knowledgeable, encouraging and inspirational. She took the time to understand my interests, and also made suggestions for experiments to try. The workshop facilities were excellent – but most importantly I feel able to continue working and exploring the material at home. This course was more about having access to the workshop, and materials rather than structured learning. You are much more likely to get something from this if you have a clear vision or objective as to what you want to achieve. Teachers were pleasant, helpful and knowledgable and provided loose instruction however I left thinking that I could probably have gained the same level of understanding from a few YouTube videos and from buying some concrete mix and reading the packet. 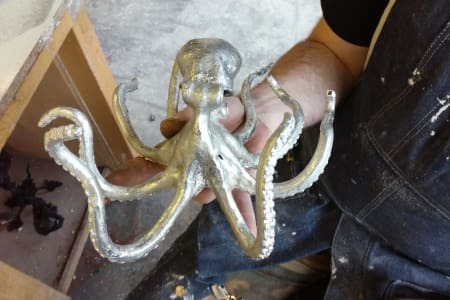 Whilst metal-working was interesting to produce the molds I will find this difficult to replicate at home and would likely resort to more simple materials (e.g. cardboard) to achieve similar ends. Unfortunately, the finished items that I produced are not beautiful nor useful and I didn't really love anything that anyone else on the course produced either. 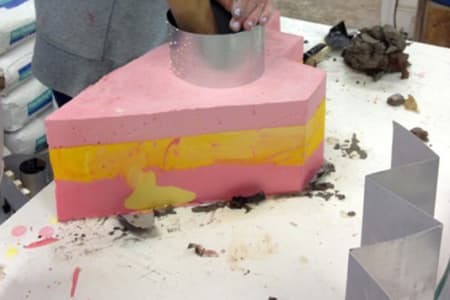 For me it would have been better if the course had more structure for example: if printed course materials were provided; if a latex molds were produced early in day 1 and then re-used with the different concrete materials and that mold were of something that one could make use of (e.g. a plant-pot or pencil holder etc.) if you didn't have an artistic end-game in mind. At least then we would have something useful to show for our efforts and something to remember the different techniques and materials. In summary, the course was a welcome break from the norm but could have been a bit better. 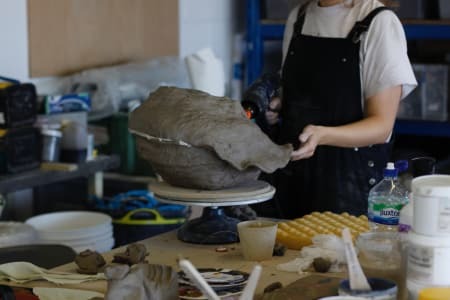 It's best suited to artists wanting workshop time and access to materials than a structured learning experience for bored professionals wanting to try something a bit different. Good - lots of information and learnt a lot, but there was quite a bit to do and there were probably a few too many people on the course - there was quite a bit of waiting around . I've done four courses at the LSW - all brilliant - friendly tutors who make the best use of the time to get the techniques learnt and at least one piece of sculpture to take home . The silicone mould making course was in the usual mould of the others I have done - wax, casting in concrete and plaster, pewter casting and bronze casting - tools and materials provided - some materials you have to pay for, enough working space with an absorbing view on the River Thames and all tools provided, pleasant banter and useful background information about the techniques used and where you could learn more. Really loved the course and learnt a lot in a fairly short space of time. It was a small enough group that we all got good individual attention. I wish we'd had more time at the end to experiment with casting into the moulds, but the teaching was great. Only thing was that we could have used more rolling pins as the first part of the process was quite slow as we were all sharing materials - perhaps this would have left more time at the end to cast into the moulds. 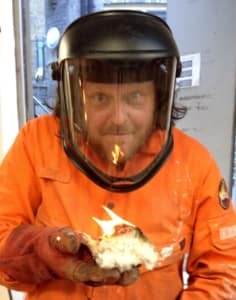 Giles, my instructor for the bronze casting course, was brilliant. The atmosphere in the studio was great, and I found the class very enjoyable. Giles is also beyond knowledgeable, being a professional artist himself he has a very good eye and is instinctive about the execution of a design. I would highly recommend this course. 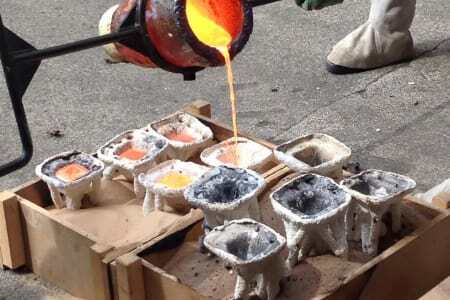 I thoroughly enjoyed the bronze casting course. Giles worked extremely hard on all of our behalfs to ensure that we ended up with pieces to be proud of. I have a renewed appreciation for the medium and the time and effort involved in producing bronze artefacts. I will look to attend a further course in the future. Follow up up class from ceramics.great fun. Glazing the pottery we had done,my plates look ace now. Thanks lsw! This was an excellent course, the teacher is calm, easy to understand and very encouraging. The workshop is clean, well organised and safe with all the equipment you could need.The course starts out with instruction and quickly moves on to your own experiementation under his watchful eye. 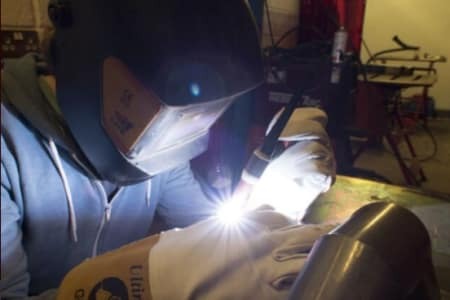 Great class for a total beginner to welding, good balance between tutorial and letting us do out own thing: plenty of safety and background but also just enough time to play with the materials and make a couple of things to take home. Thank you! An excellent introduction with a good tutor and gave a useful overview of welding methods. Looking forward to doing the full metal fabrication days. Very warm and welcoming for a complete beginner. Only downside was five people sharing a welder meant not as much hands on practice as I would have liked. Really enjoyed the course. Lauren was a very good trainer and explained everything clearly and carefully, was happy to answer questions, and go off piste when necessary. Thanks again. I had a really great afternoon - and learnt so much in a short time. The session covered Mig, Tigg, Arc and Spot welding, grinding and finishing. A great springboard for planning future ideas and projects. Excellent. Perfect balance of theory and hands-on with the emphasis on hands-on. Great tutor who was there when required but not looking over your shoulder all the time. Everyone left with a small creation. Thank you. Although I do not consider myself to be an artist, I did want to have an expert-led introduction to welding for the purposes of general repairs and new-fixture building, including for a canal boat. The course delivered that very well with excellent theoretical and hands-on aspects. 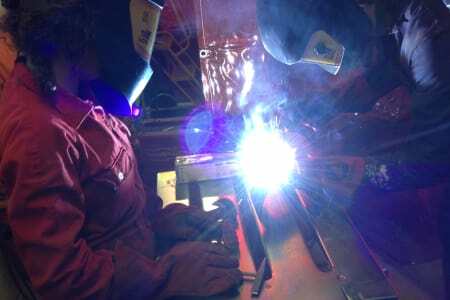 Welding is a practical activity and the course balanced that well with basic theory. I enjoyed the course and felt that it was very good value for money. 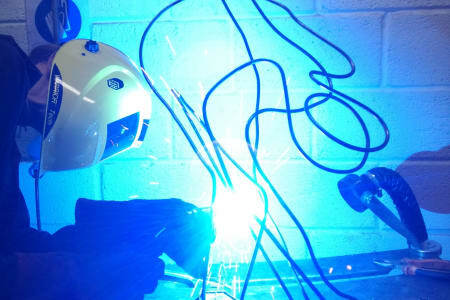 I would not hesitate to recommend it to anyone wishing to get a positive and practical start to welding, how to do it, how to fix basic issues, how to choose a welder for your needs and (not least) how to be safe. I did the 2 days welding course to understand metal and it’s properties. I had an ambitious goal to design a spiral staircase at my flat. The course exceeded all my expectations. Andrew was patient, knowledgeable and very methodical with his teaching. He helped me master the basics in measurements and welding skills. I was so proud that I was able to make a side table (albeit slightly wobbly;) in two days. I would highly recommend anyone thinking of working with metals to learn from Andrew. Friendly, helpful and fun - for me (male). Less so my girlfriend, who found it quite daunting - but the tutor eventually helped her out with an alternative approach, so she came away satisfied. Its a very basic intro so don't arrive with too much ambition! 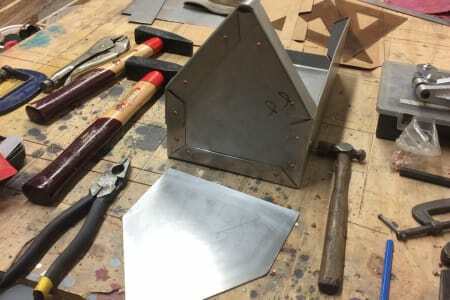 Good, and I now know understand several techniques for welding or otherwise joining metal together, including several I didn't know existed. The balance of time spent explaining various tools (including power settings on various types of welders) vs the hands-on experience was perhaps just a little too far towards the explaining for my personal learning style. If it wasn't just a 3-hour class this would be ok, and even potentially interesting, but I would say it went just too far beyond what we would need to know for that session, at the expense of hands-on time. I did come away with two practical household items made from scraps - a trivet and an over-the-door coat hook. Neither are lookers (hey, first attempt at MIG welding!) but the engineering is sound and both are now in use at home. Also, perhaps this is sightly nitpicky, but I had real trouble finding a set of coveralls that fit - they were either absolutely tiny (several sizes too small) or literally falling off my body to the point that it was dangerous - even with rolled sleeves & legs I was tripping over the material. I'm a size 12 & 5'4", not exactly unusual! Several other students were broadly similarly sized, so maybe they just got there first, but another few pairs of 'medium' coveralls would help. On balance, a solid 4 stars, and I'm really glad to have found a facility like this in London - odds are very good that I'll be back at some point to create, craft or repair something in metal. The site is fairly remote though only about a 5 min walk from a bus stop with a bunch of buses from Woolrich / North Greenwich, and never felt unsafe, even at night in the dark winter evening. Do note that Citymapper and other mapping providers may show the wrong entry location to the Thames Side Studios, which caused me and others a bit of lost time finding the place! Once you get the right entrance, the directions provided via Obby are fine. Friendly and very informative class will be returning. It was good, got to use some machinery, learn about the various welds, different joints. Informative and fun, good bunch of class mates too. What a great course! Learnt so much in just 3 hours. Andrew explained things really well and was on hand all afternoon to help and guide us. Will be doing more courses with him! Really loved it and wasn’t as scared as I thought I’d be being a complete newbie to welding! It was an interesting course with lots of ideas on how to use wax of different types. It was almost to full on for only 2 days. 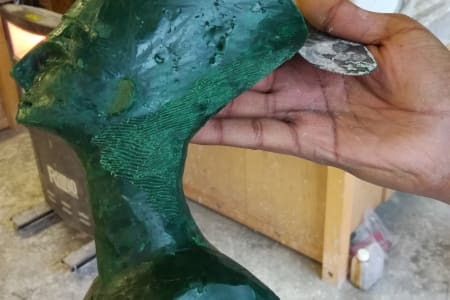 Would recommend it for anyone interested in sculptural techniques no matter how experienced you are. Good course before t not received information email from instructor as promised. Really good course, learnt a lot and enjoyed exploring with the different mediums. Tutor Lauren was great, really knowledgeable and could ask her anything. Be prepared to make your own moulds and have an idea of what you want to make before you go. Only slight comment is that there was a lacking of basic things like paper towels, other than that, really good workshop. Excellent introductionI would have liked more time for construction (rather than casting)It would have been helpful to encourage people to bring moulds with them. And to provide paper towels. Potentially a good course slightly let down by the Tutors lack of knowledge. He was a stand in as the programmed tutor was unavailable;able at the last minute. He tried hard but was unable to answer a number of queries of mine about casting vessels in Jesmonite. He also recommended an approach that failed - on the other hand we were being experimental so that was not all bad. I'm glad i went. 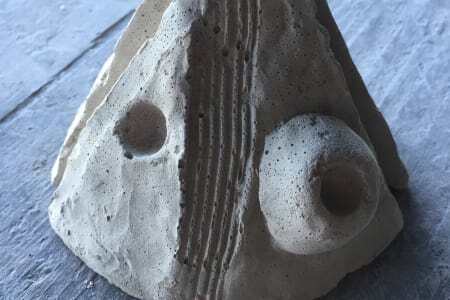 I left the course feeling confident that I can continue to use Jesmonite independently as well as apply it in a wide range of different ways in my practice. Instructor was knowledgable, helpful and informative. We had a series of demonstrations that we could then go away and try out on our own ideas. I came away with a range of exciting and dynamic objects. It’s was amazing, teaching was individual and well paced font of information. Group size was just right. I learnt so much and loads of material to use. I highly recommend sculpture work shop courses. Really informative and fun course with plenty of time to experiment with different techniques. Good teaching. Generous with the materials. Helpful staff. Only negative comments are: There must be a reason that 5/10 students turned up believing that we would be making our moulds from which to cast something in jesmonite. It was certainly not clear that the only mould making was constructing basic metal forms. There were no handouts. We all took notes but the tutor said that hand outs would be sent to us by email ; none have arrived yet. They would have been useful during the course. I know that the jesmonite info sheets give all the technical stuff but even just a list of suppliers and details of accessories such as the silicon spray and the spray on wax release agent would have been useful. But all in all a very worthwhile course. A really enjoyable workshop covering many topics (colouring, using lookalike stone, metal fillers, and quadrelax glass), I felt that I learnt a lot and left feeling very inspired. The tutor was very knowledgeable, and able to suggest ideas to help me develop my work. This was very interesting & enjoyable. All the attendees came away with intriguing artifacts & had a good trial with the techniques & skills involved. No one had done any welding & all got to grips with it. Also a friendly diverse bunch of people & Silvina was an excellent guide. Many thanks. Great course, really interesting background and very well taught skills, very happy with the result. This was not a well led course. I chose it specifically because it was a stainless steel welding and finishing course and yet absolutely no information was offered about what differentiates it from any other welding course. Not tips, no tricks, no pointers or guidelines about cleaning the metal, what filer rod to use or help with what heat settings would be best to use. We were given use of the welding workshop and left to get on with it. I specifically wanted to practice tig welding but there was only one machine between five students so time was very limited on that machine. If I needed advice or help with using a machine or tool I had to go in search of the teacher who was ‘welded ‘ to her phone screen. I felt she was marking time until we left. I came away with very little information I didn’t already know and was very dissatisfied with the whole experience. I gained nether theoretical not practical benefit. Definitely worth doing! 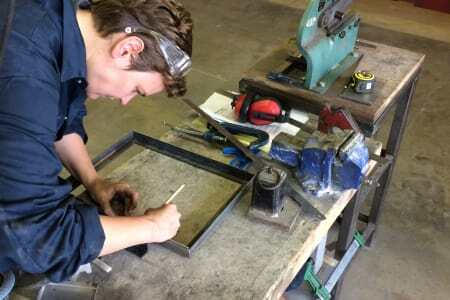 A great opportunity to learn the technique of welding and practising it whilst creating something. The quality of tuition and support is fantastic. I really enjoyed the welding workshop in the end, at first it was a little scary but our teacher Silvina was very welcoming & reassuring with her style of teaching to make you feel more confident. It was a very informative and interesting starter class. The venue was clean and accessible (though the entrance was slightly out of the way) and the teacher was really focused on and gave you good individual advice. I really enjoyed it. 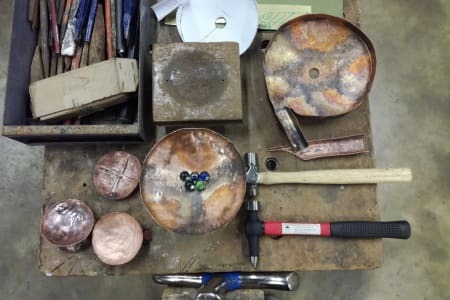 Excellent introduction to working with metal - good supply of metal to experiment with and good equipment. Have since joined the London Sculpture Workshop so that I can use the Open-Access facilities. Really great workshop, packed full of tips and tricks. 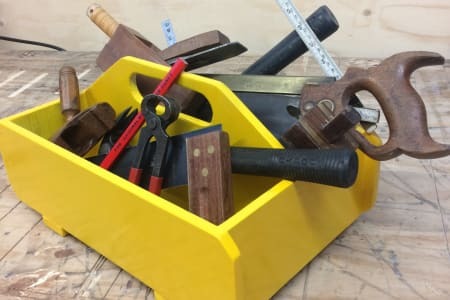 As a total beginner I gained a lot of confidence and went home with a finished wooden tool tote that I never would have even attempted on my own! I’m really excited to get the tools out now. My advice would be wear lots of warm layers as it’s quite cold in the workshop! Thanks for a really great workshop. The course was really well planned and suited me and the other participants on the course. 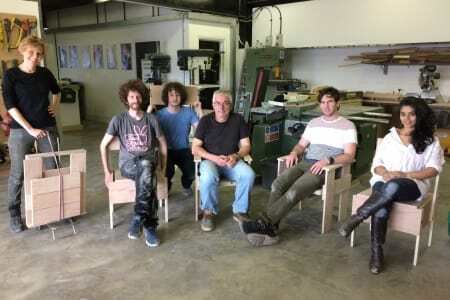 We had all had limited wood working experience and a project in mind. Andrew, the tutor, was engaging, funny and quietly encouraging. The workshop itself had the space and equipment that we needed and was in a really quiet location. I left the course with the confidence I was looking for to go off and get started on my own! Thank you Andrew and thank you London Sculpture Workshop! The tutor gave a very thorough introduction to ceramics, she was very knowledgeable and supportive. She pitched the class at the right level, catering for people who were complete beginners as well as those who had some experience. I left the course feeling very inspired. I would highly recommend. A great course, a great tutor. Thoroughly recommended. I had a brilliant day and learned loads from Andy who was a fantastic tutor. He was extremely patient with us, as we got to grips with different types of metal, new tools and metalworking machines. It was also really good to get the opportunity to complete a project in just one day. I was really proud of my new toolbox! Highly recommend this to anyone looking for an introduction to metal work.